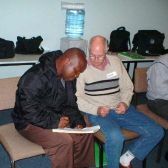 Anyone wanting to learn to speak one of South Africa's nine official African languages, and to communicate effectively with South Africans, despite differences in culture and background. Working in this field since 1990, TALK uses African language and intercultural learning as a vehicle through which to build effective workplace and personal relationships based on mutual understanding, respect and trust. TALK courses are based on the belief that language learning is a social, not an academic activity, and that language needs to be learnt in the context in which it will be used. Hence, every learner enrolling for a TALK course is paired up with a mother-tongue speaker of the target language. This person is known as a language helper, and can be someone provided by TALK, or a friend or colleague of the learner. Within this one-on-one relationship, learners are shown the skills of language learning, which will enable them not only to learn what is most relevant to their needs, but more importantly to continue learning once the course is over. Through its unique methodology, TALK is much more than language learning; it is a means to understand, appreciate and embrace diversity, thus positively tapping into the immense human resourcefulness of any workplace. * Learning language that is relevant to learners' personal needs. * Learning at your own pace. * Gaining a method of language learning which you can continue to use long after the course. * Gaining the confidence to start speaking from Day 1 of the course, by having the opportunity to practise speaking with all the mother-tongue speakers present in the sessions. * Raising awareness of differences and similarities between your own culture and the culture of the language you are learning, and how this impacts on work and personal interactions. * Developing the skills to deduce the grammatical patterns of the language within the context of using language relevant to your needs. 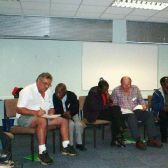 TALK courses are facilitated by two highly experienced TALK facilitators; one who has learnt, and is still learning, an African language using the TALK method, and one who is a mother-tongue African language speaker. Phase II - 16 hours, spread over eight two-hour sessions. 20 hours, usually spread over ten two-hour sessions. We shall be pleased to provide a quote which is marketplace competitive. The language learning experience has had a powerful influence on the organisation culture in opening communication between members of staff from diverse backgrounds in terms of language, culture and positions in the organisation. The methodology of pairing language learners with mother-tongue speakers was especially effective, and has provided a strong foundation for ongoing language learning and (perhaps more importantly) communication. Some of our learners have forged very strong bonds with their language mentors, and this has had a very positive effect on motivation levels and general employee relations. Comparing TALK to how I learnt Zulu at University is like "Chalk and Cheese".